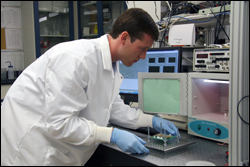 Matt Mosteller conducts a biomedical systems experiment in the MEMS Sensors and Actuators Laboratory. A paper by ISR alumnus Matthew Mosteller (MSSE 2012); Associate Professor Mark Austin (CEE/ISR), ISR Director Reza Ghodssi (ECE/ISR), and ISR Postdoctoral Researcher Shah-An Yang is featured in the December 2012 issue of INCOSE Insight, published by the International Council on Systems Engineering (INCOSE). “Platforms for Engineering Experimental Biomedical Systems” shows that that the implementation of a platform for engineering experimental biomedical systems can bridge the knowledge gap between biologists and engineers and ensure more successful system development. The research won the 2012 Best Student Paper award at INCOSE’s 22nd Annual International Symposium in Rome. INCOSE members can access the December 2012 issue online by entering their username and password.